Audio file, MP-3 only, see artist page for text. Video file, see web page for text. Foreign site, external link, NOT at Barbara's. Link to a place located on one of Barbara's Sites. Key Topic link on Barbara's Site. Picture file on Barbara's Site. Bittersweet songs from the depths of the Japanese heart. I really had no idea that this music still existed. You see, I was raised during my teen years as a military dependant, and during the 60's lived in Korea and the Philippines. Some of the pop music of the time, plus some of the oldies of the post-war years, (eg. "Tokyo Shoe-shine Boy") played over and over on the radio. But other than the bouncy new Westernized music that everyone was listening to, there was another type, one I usually heard when eating in Korean and Japanese restaurants. I took no notice of it at the time, being a stupid teen-ager, but some of it stayed lodged in my subconcious. 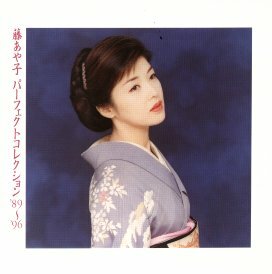 Then a few years ago, having gone through a relatively short tour of fandom in the Japanese Pop (JPOP) genre, I was in a music store and stumbled over a CD, (Youko Nagayama: "Shiawase Ni Shite Ne") and thought "Oh goody... some of that Japanese restaurant music I heard from when I was young." and I bought it. On first listening, I was surprised how modernized some of the music sounded. After hearing it four or five times, there were already several songs I was fond of. And so, I was now reintroduced to Enka. A friend of mine once remarked that these were "Japanese torch singers" and that's a fairly good description. 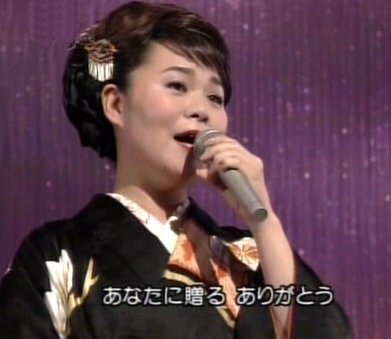 Enka songs are 1 to 6 minutes long, and are performed standing, usually wearing formal attire. For men this can be either Japanese or Western attire, for women it is generally a kimono. (Korean and Chinese women seem to usually sing Enka in glittering gowns.) The song lyrics are tragic yet philosophical, and sometimes even amusing. Drinking songs are common, usually to help "drown my sorrows". Songs of love, separation, death and suicide abound. The subject matter of the typical lyrics involve tragic love and sweet resignation to the comfort of cherished memories of better times. Arrangements use a unique mixture of Western and Japanese instruments, from the koto to the electric guitar. Violins are common, but surprisingly, pianos are not. Enka thrives in Japan with the older generation. 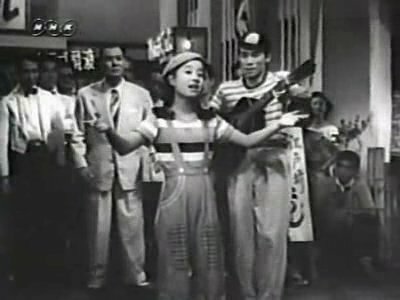 Korea, however, sometimes claims to have been the birthplace of modern Enka music. This is probably partly true. There may also have been influences from China. Constant wars in the 20th century have spread cross-cultural influences through the regions so often that one may never be certain of Enka's true roots. 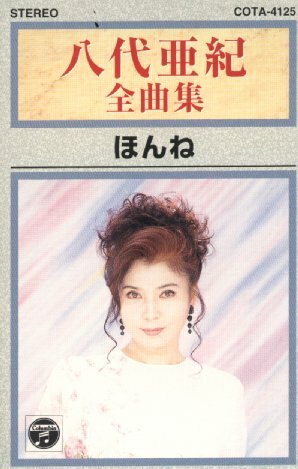 Yoko Nagayama as hostess of her own TV show. However, history isn't the important thing. Enka is a living music, being composed and performed right now. After all, we don't think of New Orleans when we hear modern Rock, though its roots can be traced there. There are Korean songs which sound much like Japanese Enka, but I'm uncertain whether the Japanese consider those songs to be Enka or not (probably not) even if the Koreans do consider them to be Enka. 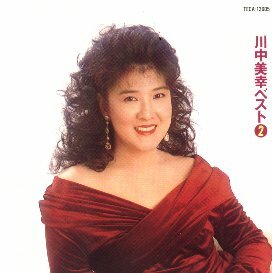 Likewise, some songs from Hong Kong seem like Enka too.� I don't like being too restrictive with the definition of Enka, myself, though perhaps Japanese people might feel differently.�� Japan is proud of Enka, and rightly so, but Korea and China are a part of the music's background from the 1930's on through to today. 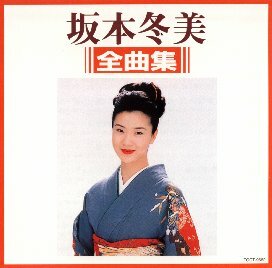 Enka doesn't have a large fan base among the young in Japan.� Many of them sincerely dislike Enka.� This may partly be due to the fact that their parents liked it so much they played it all the time while the children were growing up.� Does this mean that Enka will disappear with the older generation? I don't think anyone knows. 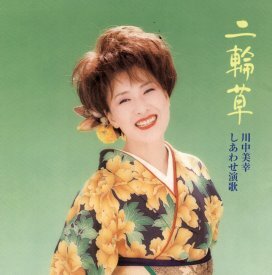 Like any music, it will continue to change, and chances are that a new generation will "rediscover" a "modern" Enka some day. Music is made for people who want to hear it, and if the tastes of the people change, the music will change too. There are a few new young Enka singers, so it is hopeful. The new Enka singers are experimenting with variations on the traditional style, keeping some elements, and discarding others. This may be the only way Enka can continue to grow in the future. 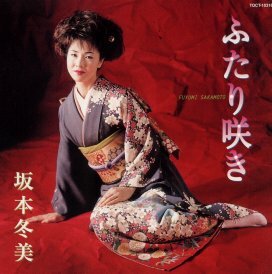 Nostalgia is a potent thing in Japan, but it alone probably isn't enough to ensure that Enka continues; new listeners are needed. I bought about half these albums at the Kinokuniya bookstore in San Jose, CA. The other half I bought directly from Japan, using 3 sources: www.soundcity2000.com , The Place , and CD-Japan . Of these sources, I was very happy with the fast, reliable service of CD-Japan. I was fairly well satisfied with The Place, a slower domestic importer, but I was very unhappy with the web outlet www.soundcity2000.com, so I don't recommend them. It looks like they are no longer in business, or have assumed an alias. Note that a lot of these albums have certain "standard" titles. One is "Zen-Kyoku-Shuu" which means "Complete Song Collection". A performer might have several albums with this title. I think that the idea is that if the fan buys all the Zenkyokushuu albums, they end up with all that performer's songs, but unfortunately they also end up with a lot of duplicates as well. For instance, below I list two albums by Toshimi Tagawa. One is a Zenkyokushuu, and the other is not, but each have about 16 songs. But together they add up to only 24 unique songs, the rest being duplicates. So the fan can only make a complete collection either by buying all the albums, and putting up with repeat songs, or by buying singles only, which is even more expensive. One way to avoid some of the duplicates is to get a catalog which lists CD's by song title. I use "Popular CD". This thick catalog is entirely in Japanese, but even if you can't read the song titles you can match them well enough to tell which albums contain the most new material. You can order a copy of "Popular CD" from your local Kinokuniya store, though it will cost over $80. Another variation on "zenkyokushuu" is "tokusenshuu" (Special Honors Collection, Special Prize Collection.) Some other "standard" titles are "Best Selection" (Best-of), "Special Selection" (good songs which weren't on the "best-of" album), "Perfect Collection" ("perfect" meaning "really really complete" instead of just "sort of complete") and "Best 16". It's a good deal getting 16 songs on a CD, since most CDs are released when the performer has only 10 new songs. The prices are very high. At Kinokuniya and by mail order, I paid about $33 for each of these albums. So this small collection represents over $800. I've been unable to locate any way to buy used albums. The only alternative I've found is to rent tapes of TV shows featuring Enka singers, and make a recording of the sound track, but the sound quality is so terrible that the results are disappointing. So for the time being, I have to pay for the albums. Will you like Enka? If you are an average Western music fan, the odds are against it. It sounds wrong, at first. Repeated listening may reveal one or two songs that appeal to you, though they will continue to sound very strange. 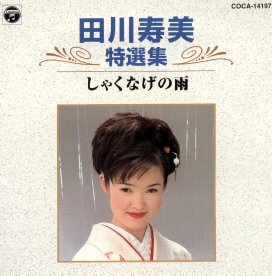 Once you have found a few songs you like, then you might find yourself listening to Enka with "new ears" and songs you didn't like at first will now sound good. It takes a long time for the Western ear to become accustomed to this music, and only music lovers with patience or repeated exposure are likely to be interested enough to explore this genre further. I was lucky, myself, having heard this in childhood. Some of you will really come to love this music though, I guarantee. The key to this site is the map on the upper right of each page. Study the site map carefully, and you should be able to reach every part of this site directly from any other part. Each of the artists can be reached by clicking on their name. I'd like to express my opinion regarding web site design. The site map is a substitute for a frame. I realize that most of the performers llsted here are female. Though women dominate Enka, there are male performers as well. I started out liking the female stars. But I also thought they had better material. So, I didn't bother including much information about male Enka performers on this web site. But I'm working on correcting that. Keep in mind that this is all one fan's viewpoint, and so you should realize that your own tastes will be different. But if you don't know where to start, you can start with whatever opinions I can offer here, and that's better than nothing. A few of the albums are rated on a 0-9 number scale, when it seemed reasonable to do so. I want to stress that the ratings are extremely subjective and you shouldn't rely on them very much. 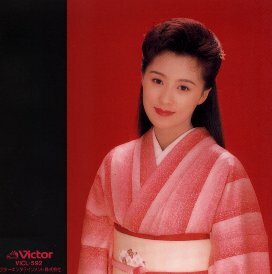 Long ago someone gave me a list of their favorite Enka vocalists, so that I could begin researching them one by one. I certainly am grateful to that person, and what I'm doing here amounts to passing on the favor, perhaps. All the translations and readings of names here were done by myself, unless otherwise indicated. That means that some mistakes are probably included. I have a basic knowledge of Japanese, but I also have a high error rate. I've probably included errors of fact on this site. Nothing on this site should be considered "authoritative" so don't use this material for term papers. And feel free to point out my mistakes. Detailed information is gleaned from interviews on NHK, Japanese web sites, Japanese Wikipedia, record company official sites, Christine Yano's fine monograph, and various album covers and notes. I have made an effort to avoid using English web sites in assembling this information for two reasons - one, they have far too much erroneous information, and two, a lot of them were made by paraphrasing (or sometimes even brazenly copying) information they first found here at Barbara's Enka Site. This is especially true of the English Wiki-type sites, even including Wikipedia itself. I am flattered to see this site used as a resource, but I see details, even errors, appearing on other sites after I put them here. I promise to correct errors on this site, but other English-language sites may end up keeping misinformation, since I obviously cannot edit all the other sites too. I contribute to Wikipedia on many other subjects but as far as Enka, I don't want to deal with the clean-ups, tug-of-war contests, and authoritarianism there. My contribution is this site, nothing else. I realized after initially finishing this site that what was needed for the English-speaking purchaser of these albums is a list of names in English and Japanese both, to make it easier to locate the performer on the shelf or in a catalog. This resulted in the English/Japanese graphic name titles you see here at the top of each performer's page. 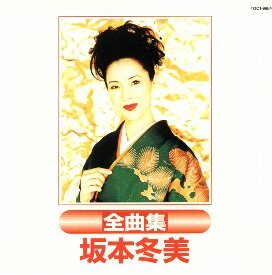 Since the Japanese record companies can't imagine that English-speaking people might want to buy Enka, they often omit putting the performer's name in English on the CD. I hope that they eventually change that practice. Japanese names can be read in a variety of ways, and it is no easy task for a beginning Japanese student to decipher names. The album listings are in NO particular order. The same for the artists, links, and everything else. Note that the album covers may be copyrighted by various record companies, but I doubt they would object to having them on this site, since they can't do anything but increase sales. They would be crazy to suppress the world's largest English-language Enka website for publicizing their albums and artists. But just for the record, here is my statement: this site is a work of critical appraisal, educational review, and cultural commentary and journalism, and is not a work of profit, and as such its use of these pictures, extracts, and clips falls within the broad US definition of "fair use". (Though in fact this is a Canadian website.) All remaining rights to the text and material on this website are reserved. Sound samples here are in MP-3 format, and are only long enough to give you a first impression of the performer's voice. Keep in mind that it might be a mistake to generalize too much by hearing a few seconds of one song, since songs and styles can vary so much. I may have picked a song because it "sounds like her" more than because it's her best. Note that this server is small and you may get "busy" messages from time to time, so please be patient and considerate when accessing sound or video files. You will find a few downloadable videos here but not a lot. 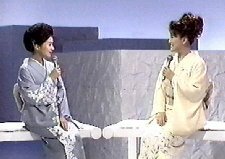 For those who want more, I did make several of my old treasured Enka TV concerts and videos into DVDs that can be played in any DVD player. They are available for request now on a little experimental site I made here. I promise to put at least one new enka video on the list each month, so please check back. Send mail to me by going to the very bottom of the page and using the form there. I'd enjoy hearing from you. Enka fans are scarce outside of Japan, and I have hardly anyone to share this interest with. I'm a 56-year old woman living on the coast of North Central California, USA, at Santa Cruz. 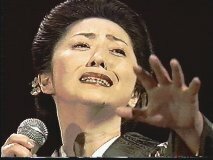 I've made quite a large group of Enka-related videos on tape and DVDR, along with other Japanese & Korean cultural videos. If you think you might be interested in some of them, I can sell copies to you for around $7 per tape or DVDR. To see the list, send me email using the method mentioned above, or follow the link shown in the previous paragraph, and I'll give you access to the request list on my website. My other interest is anime and fansubbing. Take a look at the anime section of the site. You will find a reply form at the bottom to add your comments on each page. Hello Barbara. 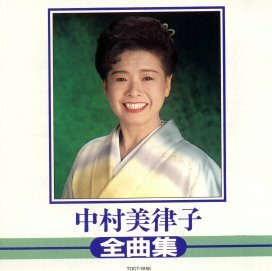 I've been interested in Japanese 'enka' music for over 30 years, but it's difficult to get that sort of music in Australia. I would be interested in obtaining a CD or DVD by this singer in the picture. (can't read her name) The Album was given to me by a Japanese seaman in in 1970. 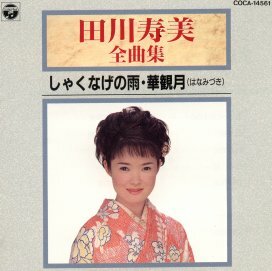 My favourite song is "Meiji Ichidai Onna" , originally written in the 10th year of Showa (1935). Would that be classed as an Enka song ? 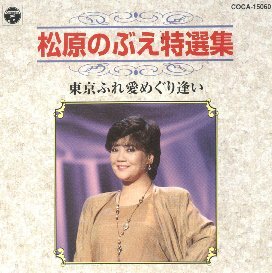 I'm a 44 year old portuguese living in Macau and I do like Enka. I've been living in Asia for 15 years so "unusual sounding" music is not so unusual anymore. Funny you mentioned the music slowly creeping into you to a point when it starts to make sense musically. I used to live in a place close to a temple where they occasionally had chinese opera (in cantonese) and then, suddenly, it started to make sense. Hello, I visited your website while noodling around at my computer here. Great information. Thanks for assembling it all. Thank you SO much for putting this together!!! My husband and I lived in Japan from 1977-81, and again from 83-85, and we *love* Enka, but I don't own any on CD...I have a few ratty cassettes, but that's about it. One of the friends from that period with whom I am still in touch is from Yokohama, and her mother grew up with Hibari Misora!! Of course, my friend Misa loved the Beatles, and hamburgers (and couldn't understand why I would rather listen to enka and eat soba.) :) ANYWAY - I've bookmarked your wonderful site and will explore further when I'm not so slammed with other stuff I should be doing instead. :) BTW...I'm a 54 year old "army brat" / ex-Navy woman living in Seattle. I knew I had to email you when I read this: "Enka fans are scarce outside of Japan, and I have hardly anyone to share this interest with." At least you are living on the West coast. Try living in Philly. It is difficult to find someone with an interest in anything Japanese. (Unless you count the kids who are only interested in the latest anime.) I'm retired Navy and about to finish my third year of Japanese before I move to Japan to teach English. I'm still learning about enka. Right now it's like they say about art, "I don't know what it is, but I know what I like". Well, I do know what Enka is but I don't know artist or song titles. I just found your site so I'm still digesting it. The audio clips you have for each artist will be a big help. I spent this past summer in Tokyo. (The main reason I stayed in Philly so long is that Temple University has a Tokyo campus so I figured I'd go back to school here before moving.) This time around I was able to listen to enough enka while I was there to change my opinion that every song was more or less the same. Previously enka was something I had to "be in the mood for". Now that I'm back in the states, I realize that I should have kept notes or something whenever we went out for karaoke. By the way, when I try to tell people what enka is, Kill Bill helps. Both movies ended with songs from Meiko Kaji so I like telling people that if they have Kill Bill they actually own some enka. I shocked the hell out of my new friends this summer when someone did one of her songs and I was able to sing along parts just from memory. Thanks for giving people a decent enka site. 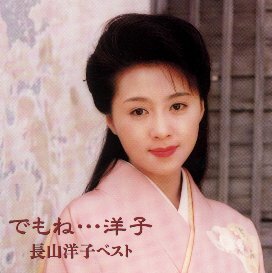 I loved enka ... from the instant I heard an example. According to your site, that makes me unusual. I've referred a lot of people to your site. But I'm having trouble finding male Enka singers. Any suggestions? --K. I appreciate the work you put in to your Enka site. Whew! I'm sure glad I found your site! 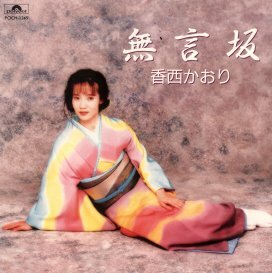 I've been looking for a site to order enka music for some years and not being too familar with using the internet (I'm learning, thoug) I've had a hard time. I found the Japan site using iTunes, but I found I could not order from there. But I will be ordering real soon. 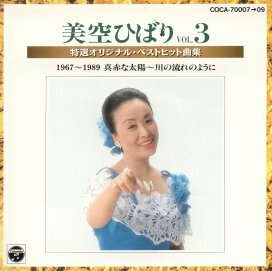 As a Native American who served in the U.S. Marine Corps during the Vietnam Era, I heard and liked enka music right off the bat; in fact, even without understanding the Japanese language, I still went to their sumarai movies in Honolulu - so, I will be looking for some of these movies as well. Again, thanks for your site. Hello Barbara, I've been doing some googling online about Enka and found your site. 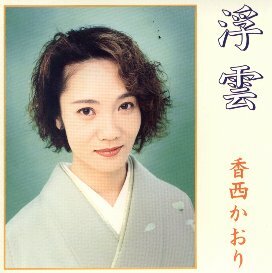 My curiosity grew when tracking down the author of the original version of "Kurumaya-san", which was recently covered by Shiina Ringo (I'm a big fan of her albums). But I like the song itself a great deal, and I'm interested in hearing the original. 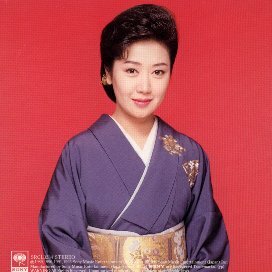 I read on your site that you're selling DVDRs of Enka videos, and wondered if you have any of Hibari Misora, hopefully specifically of that song, though if you've assembled any overview of Enka I'd certainly be interested in that as well. Also if you have any recommendation of the best single-disc Hibari Misora CD, I'm all ears -- let me know. Thanks much! Barbara, If you have time I have some questions. We get TV Japan (mostly NHK). My wife and I like Enka. There is one artest, Aki Yashiro that I especially like. 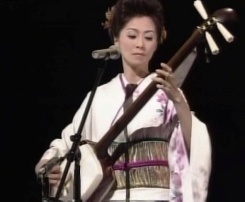 She is not exactly Enka. The songs she sings in the blues, and jazz style are especially good. We don't have access to Japanese CD's so I am not sure about titles (tracts of CD's). She produces a lot of different music. Is there some place on the internet that decribes what type of song a perticluar title is? I like your web site. You must have put a lot of effort into your web site. It is very kind of you to do it. Thank you. Hi Barbara, My name is hans and i'm from kuala lumpur, malaysia. 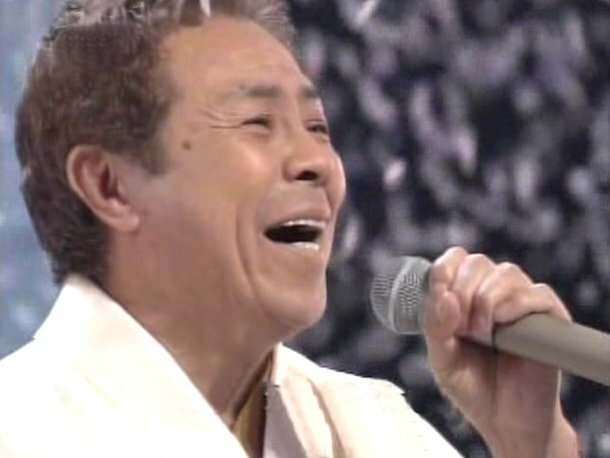 I've been an "on & off" follower of the sound of enka and my favourite singer is none other than saburo kitajima. I've a few CD's of his songs plus on a few other singers as well. Could you send me a list of which you mentioned in your website. Hi Barbara, I enjoyed reading your enka site. Thanks for the introduction to a music unfamiliar in the West. I want to listen to some, but the choices are overwhelming. I was wondering if you could suggest 3-4 songs that would be a good introduction, a sort of "best of" list? Thanks for your help! Dear Ms. Barbara: It gives me pleasure writing this e-mail to you. I am Hala from Egypt. I had the pleasure of staying in Japan for a while. 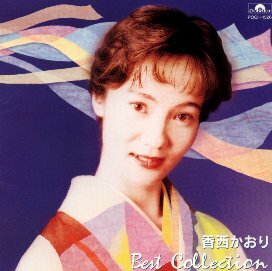 I do share your admiration for the Japanese old songs "Enka". I was really ataken by their Enkas. Whenever I listen to one of those songs I am deeply moved and touched magically. Unfortunately, I have not had the chance to buy, copy or tape but a very few songs. I wonder if there is a website which allows me to listen continuely to Enkas. 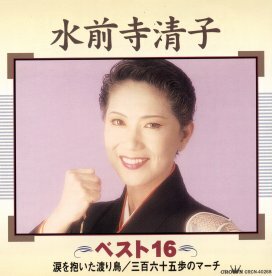 I also wonder if you have a CD for a female singer (I don't exactly remember her name), the most famous song for this lady singer is titled "Koybitou Yoou or Oh my Love"". I especially consider this is one of the finest Enkas I have ever listened to ever. I hope you have the time to answer to my questions. Waiting to hear from you so soon. Best regards. 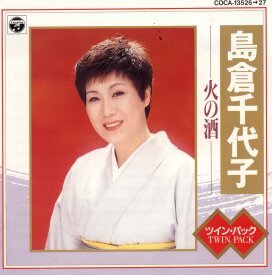 Aloha Barbara, It's taken me a few decades, but I've finally become a fan of enka at the grand old age of 56+. I've actually been a fan all of my life, I just didn't know it until I started going to karaoke parties a few years ago. It wasn't until last year that I began to compile a collection of enka, and it's steadily growing. I first started collecting songs for my aunties who are well into their 70's now. I'm ashamed to admit that I am not bilingual, and actually speak more Korean than I do Japanese. I'm a sansei who never attended Nippon-gakko as a child, nor took Japanese language classes as a teen or adult. I learned Korean when I got stationed in Korea while in the Army. It seems that I wasted a lot of years on American rock 'N roll, and pop music. However, I was a fan of Masaaki Hirao as a young boy, and listened to my mother's collection of Hashi Yukio, Sen Masao, Murata Hideo, and of course, Hibari-san records. I just never knew that this genre of music was called enka. Now that I've become a full-fledged fan, I learn from everyone that enka is a dying art...that enka will probably die with my generation. Well, to that my retort is that they don't make movies like Yankee Doodle Dandy, or The Easter Parade, or White Christmas, anymore. They also don't make music like In the Still of the Night, or Dreamy Eyes, or Since I Don't Have You, anymore either. This type of entertainment, and those entertainers are a dying breed, like us fans. I don't listen to most of the music that my children listen to, and they probably won't listen to the music their children will either. Thank Heaven that websites like yours exist. It allows folks like myself to reach out and touch a part of our culture that got lost in the shuffle of being an American. Don't get me wrong, I am proud to be an American, having served "Uncle Sam" for more than 36 years. It's just that when my mother passed away, it seemed that I lost touch with my Japanese ancestry too. Luckily, I got introduced to karaoke, and it also awoke my interest in my roots as an AJA. Thank you for taking the time to read this tedious message, but moreso, thank you for creating your website. It has helped me reembrace my ethnic heritage and pride. Thanks so much for posting this information! I love Enka, and I traveled to Japan as an exchange student, where my host family took me to karaoke and sang it! This brought back great memories. Thanks a lot! HI there, thanks for the great site. I am wondering about the male enka singers. Hikawa Kiyoshi is wonderful but he is the only one I know. Do you know of other male singers? 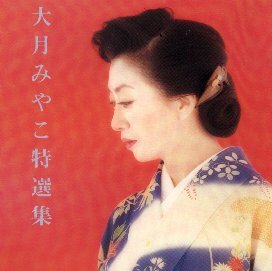 A large number of inquiries I receive here and by email are from people looking for songs - either free downloadable enka songs in general, or a particular, very hard to find song, or possibly detailed lyrics for a song in English or Japanese. However, I have almost no information of that kind I can offer. I'm sorry. Barbara, While flying to Japan many years ago on Singapore Airlines, I listened to an audio channel of Enka music and fell in love. I cut the page from the entertainment magazine because of the kanji and brought it to a store in Tokyo where I purchased my first Enka CD. Having found your website, I would love to purchase some of the CD's you recommend but I find it nearly impossible. They are either out of print or simply not listed in your referenced sources. Help? I want to really expand my collection. Thank you for such a wonderful site! 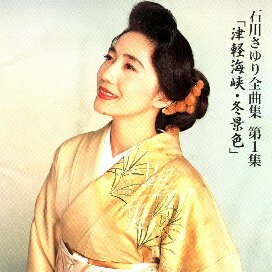 I have been listening to Enka for over 38 years. My wife is Japanese and our youngest is 35. I enjoy Yashiro Aki, Mori Shinichi, Kei Unsuku, and many more. 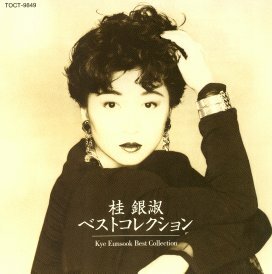 I also enjoy popular artists from the 70's and 80's from Pinky (Kon Yoko) and the Killers to Sakamoto Kyu. I watch Ultraman and Abarenbo Shogun. I know my domain name is misspelled but someone beat me to it. I am listening to Yashiro Aki's music now at work. 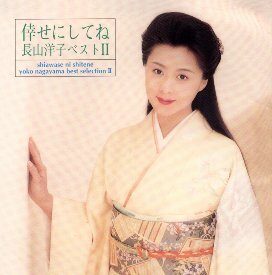 I really love Enka, but unfortunately I forgot about it for a long time. My great aunt lived in Japan and left me an old Enka (or folk?) record when I was 8. I listened to it a few times and then forgot about it. 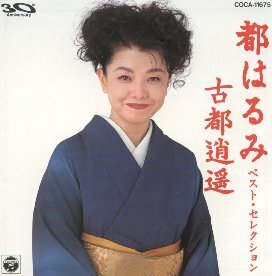 Now it has been over 15 years, and I can't remember it that well at all, except that it didn't seem as jazzy as much of Enka is, but somehow more cheerful? I moved to Japan this April and discovered Enka on NHK. I want to enter Nodojiman for fun (do you know it?) Anyway, I made a video, I guess I am on key, but it's hard to tell? Something doesn't seem right. I know that I will never compare to Ishikawa Sayuri of course, but I can't even distinguish what it is about it that isn't right??? Since you seem to be an expert, I wondered if you would mind watching it (if you have time), ha ha! Please feel free to criticize the problem in a reply. Thanks! (Also, I mean this to be email rather than a comment, so please just reply that way if you do.) Thanks so much again for your time, and great website!!! Thank you very much for this site. 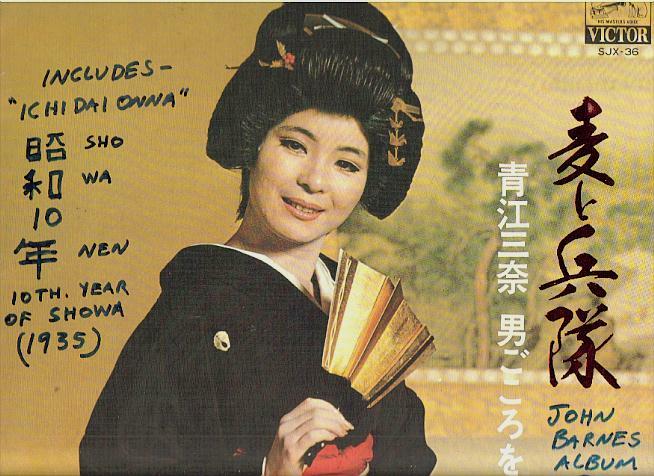 I fell in love with enka in mid-1964 through Misawa Akemi's "Shima no Blues" which was then current on Japanese radio. Stupidly, I didn't buy it then, and while I spent 35 or so years in Southern California where enka was comparatively available, I've never since found that particular version. 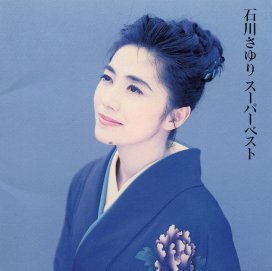 Amazon has a CD titled "Misawa Akemi - Shima no Blues" but it contains only four tracks of her singing (the other four are instrumental only) and these seem to be recent recordings. They do not demonstrate the vocal and emotional range she once had, nor the wonderful raw, guttural quality she could achieve, seemingly effortlessly, both of which reminded me strongly of Piaf. In any case, thank you once again for spreading the word about this wonderful music and for having information on several singers I had not previously heard. Hi, I am a Canadian of Japanese Ancestry. Third generation to be exact. I grew up listening to Misora Hibari, Yashiro Aki, etc. I used to work at a Japanese food store in Vancouver, BC Canada when I was a teenager. Records were sold there, so I got exposed to a lot of Japanese music. I always liked Enka. I'm a bit of an audiophile and I enjoy listening to well recorded and produced music. For some reason, records and CDs produced in Japan just sound better. Anyway, I tried some of your links and they don't work. Most likely because of the changeover . Anyway, I've bookmarked your page. Looking forward to reading the rest of your site. I'm 50 years old, BTW. where can i buy korean enka music/ i mean sung in korean language -not japanese. Barbara's reply: I don't know! I am sure there is a thriving Korean CD store online somewhere though. It should not be too difficult to find. I'm very glad that I have found your site. I lived in Okinawa-ken as a child for a two and a half years. I later lived in Kanagawa-ken from 1969 to 1973. I especially enjoyed the performances on New Year's Kohaku Uta Gassen. Are these performances on DVD? If so, how can I purchase them formatted for the US? I have loved Japan and Enka music most of my life. Kitajima Saburo-san is a favorite along with Hashi Yukio-san and Mori Shinichi-san. Thank you for your efforts in providing this wonderful site for Enka lovers. Your comments, questions, or contributions will be very appreciated. and personal information are not be revealed. After typing your comment, click on "Send Email Now".